We’re back at you with dose number 45 of the Hart and Usagi Podcast. Off the top I let you know of our new Twitter account for the show. It’s @HartandUsagi! So please do follow for updates and notifications on episode releases. As for the rest of this episode, Usagi704 and I give our thoughts on various topics. We reminisce about the Game Boy which recently turned 25, Adam Sessler leaving video game coverage for other interests of his, the infamous Atari landfill, and much, much more! * In Tangier the Parade Bar is closed…. * Are Video Gamers Athletes? * Think The Cassette Tape Is Dead? Then Why Did Sony Just Squeeze 185TB Of Data Onto One? Capcom Esssentials is a compilation at retail of five previously released games: Dead Rising 2, Devil May Cry 4, Mega Man 10, Resident Evil 6, and Super Street Fighter IV. It’s now time for the final half of my 2012 awards! Lightwarrior179’s first time on the Hart & Usagi Podcast was fun talking about mainly the Mass Effect 3 debacle (#13). Episode 15 was a post-E3 show. Madtyger was a welcomed guest for the first time in our post-PAX show (#18). The most fun, however, was the jumbo 19th episode with SonicHomeboy and midway through a call to madtyger. All of these podcasts are fantastic for different reasons. The Giant Bombcast for gaming, The Jimmmy Dore Show for a comedians take on politics, and MLW for pro wrestling talk featuring former WCW talent Konnan. No More Whoppers is the winner for being a consistently entertaining mix of gaming and life in Japan. It’s fun stuff! Madtyger runs a gaming clan (GPY) which I’ve played with on several occasions. I won several of these events. Most notably Mortal Kombat Arcade Kollection and Crash Commando. I ultimately had more fun playing Call of Duty 4 and that was after Usagi704 couldn’t join us because his PS3 rejected the online portion of the game. It was fun to get owned by madtyger. Thanks to all of the responses from everyone in early 2012, I played a number of games I owned but hadn’t yet started. Of all of them these were the four I enjoyed the most with my lone platinum trophy gained in the last calendar belonging to the most fun of these being Assassin’s Creed II. I also have to give props to Deus Ex: The Conspiracy. It gave me a lot to think and talk about during the time I played it. In a similar fashion to the award above I asked which of the games on my Backloggery mastered list I should revisit. All are great fun and were so once again, but, man, if I don’t love Castlevania: Aria of Sorrow and its copious amounts of replay value. I don’t consider myself big into platformers, but that might have more to do with the downplay of them in today’s gaming environment. Regardless, I do love the greats and Klonoa: Door to Phantomile is certainly one of those. Last year’s winner was Run Saber. It easily took the crown, but this is a bit of a closer race in that I didn’t expect to be surprised by as many this time. Lost Planet was more exciting than I thought, Tony Hawk’s Pro Skater 2 went better once I seriously tried to play it, and Beyond Oasis was less confusing than it seemed initially. If anything Deus Ex: The Conspiracy was thought provoking enough to inspire four blog posts my yours truly. It also had several ways to tackle most missions making for a unique experience (one I didn’t feel was hampered by being on the PS2). A great open world game, platformer, shooter, and action game. All I’d highly recommend with Devil May Cry being at the top. I put this game off as being not for me for a long time. But when seeing it again with fresh eyes and via the HD collection, I had to give it a shot. It didn’t disappoint and I now see why it was and still is highly influential and considered a classic in the truest sense. The list below shows every game that I finished in 2012. The total number comes to 51. That’s up 11 from 2011. August, September, and December proved to be the best months for beating games with 6 in total for each with a monthly average of 4.25. When it comes to earning those fancy trophies, I was able to earn 207 last year. One of them was a platinum from Assassin’s Creed II in April. If you haven’t got enough of my currently playing blogs, then you’re in luck. It’s time for my monthly recap article, Now Playing. During the month itself I covered Max Payne and Deus Ex: The Conspiracy for the PlayStation 2. Click on the game’s titles to read all about them. Now onto what I didn’t previously cover. I quickly finished Contra on the NES as I love to do. I did so after watching Craig of ScrewAttack finally beat the game without the Konami code. Something I did many years ago and still do. Another game I love playing against Usagi704 is Super Street Fighter II. At the beginning of the month I surprised him with my crazy Balrog and within the last few days baffled him with Chun Li. Of course, he does have characters that he can use to dominate me, like Ryu and Sagat, if he chooses too. Staying on the two-player fun, Usagi bought and finished Fighting Force. I was “forced” (see what I did there?) to pull out my copy and get into the pummeling action. I was having a bit of a difficult time until I learned the game better when playing and completing the game on Normal in co-op mode with the female characters Mace and Alana. They are really good to use and much better than Smasher. I’ve since one credit cleared the game with Alana, Hawk (who I also like), and Mace. My best score was 564,800. A game I’ve played off and on for awhile has been Medal of Honor: European Assault. Once I completed Deus Ex, I went to quickly get this one out of the way. I did so with around six missions that were left. I mostly just ignored the squad given to me. In fact, the game strips them from you once you enter the bunker (sounds like Deus Ex again) on the impossible last mission where enemies keep spawning without an end. When are developers going to realize that this isn’t a fun challenge. It just down right makes me want to scream. If I ever play this game again, I won’t be playing the final mission. With our dryer needing a bit of repair, I needed something to play while I was waiting for clothes to dry at the local laundromat. Usagi picked the GBA version of Prince of Persia: The Sands of Time over two other choices. It plays as you’d expect for the platforming, but there are extras thrown in which don’t work very well. The sand powers are used to rewind a mistake, but you have very little of it and will absolutely need it for other things. You can pick up refills, but you don’t have the tanks from the console versions to store more. The other things you need the sand for are slowing down fast moving obstacles and, the oddest use, to deal damage to a recurring boss in that you hold the rewind button while striking the target. At points you can turn invisible, but as it’s depicted on-screen makes it extremely difficult to see the Prince. It also doesn’t help that the save points are usually several rooms away. This has been a pretty frustrating game. It’s not one I’d recommend. Stick with the classic console versions. That’s all for this edition of Now Playing. I’ll be continuing on with the next game on the list of suggested games to play by my GS gaming buddies. It’s going to be Assassin’s Creed II as suggested by Gigastormz. 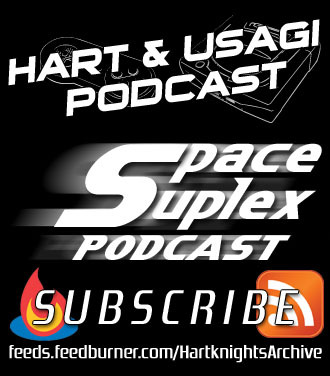 Be sure to catch our latest episode of the Hart & Usagi Podcast if you haven’t already. Laterz!